Suspended in the courtyard of the Marie-Elisabeth-Lüders-Haus building in Berlin, which contains the Parliamentary Library and Archives for the nearby Reichstag, Mehr Licht is a new addition to the collection of the Bundestag (German federal parliament). 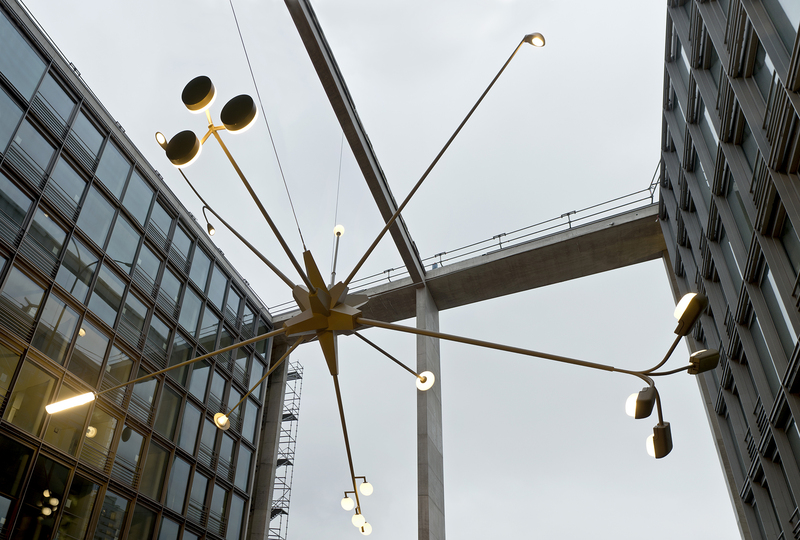 While jewels and decadent ornaments would typically adorn a chandelier, Mehr Licht is alternatively composed of a collection of distinct street lights, each indicative of a distinct civic aesthetic. The flat horizon has been folded and the streetlights, ordinarily vertical, are variously tilted; a cityscape is collapsed and reassembled to create a satellite, suspended in space. 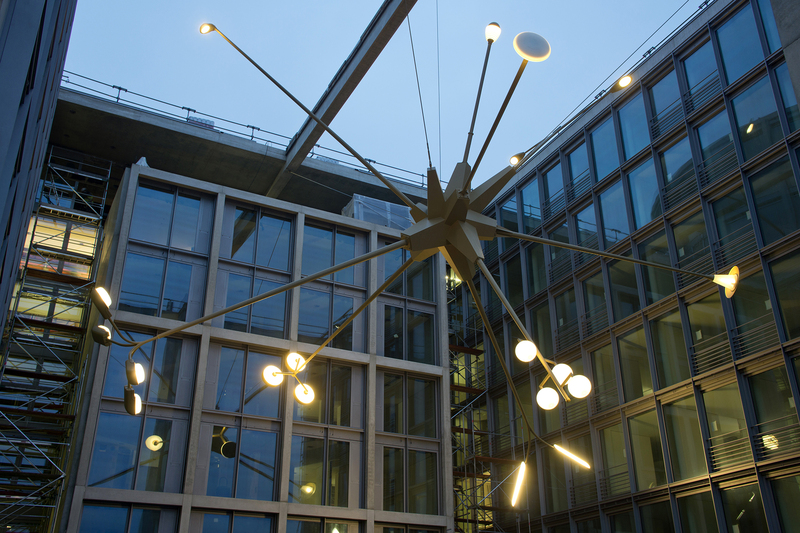 Projecting outward from a composite core—a polyhedron is formed from the agglomeration of different streetlight-bases as the long arms of the sculpture extend into a stellation. Mehr Licht is a tug of war between an inward tension, drawing strength toward the centre, and an energetic burst of rays, radiating outward. 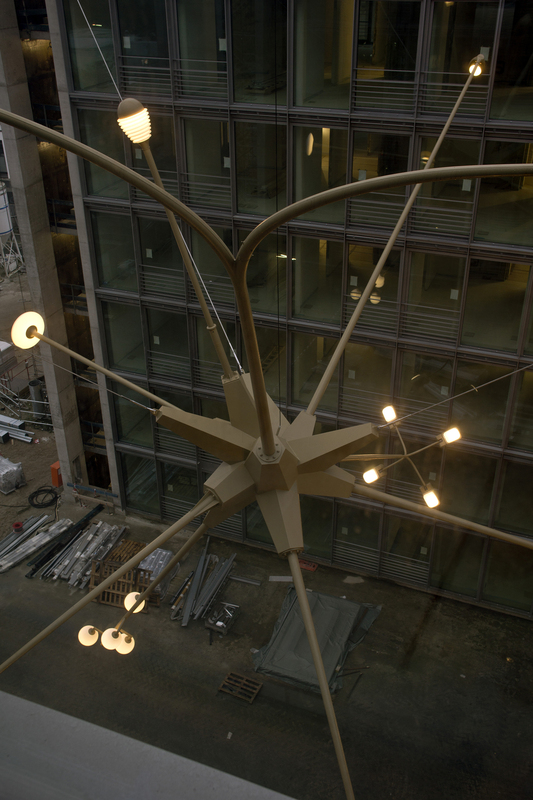 The asymmetrical assemblage expands light in all directions, gesturing past the walls of the courtyard and building to various points throughout the city; a refraction of Goethe’s last words, Mehr Licht (more light).